Here appear occasional jottings of my random musings. Profound or jejune, they reveal the contours of my mental universe, with world history, intellectual history, civilizations, philosophy, religion, society, knowledge, and books as some major themes. Since May 2011, this blog has been exclusively focused on Singapore. All my other reflections are now posted in "Notes from Noosphere" (see link under "Miscellany" on the right margin). And now, less than a decade after his speech, not just a hundred flowers have blossomed, cyberspace and Hong Lim Park have merged into one gigantic political force never seen before in Singapore’s history. This certainly was not what he anticipated. If Lee Hsien Loong’s 2004 speech was a branding exercise to distinguish himself from his father’s knuckle-duster politics, the latest regulatory framework to control news websites signals the end of the liberal pretence. In essence, independent bloggers carrying news on Singapore can be required to put up a bond of $50,000 if so required by the government when they pass the threshold of readership. The new regulation would empower the government to impose a fine of S$200,000 or imprisonment of up to 3 years against those who fail to remove offending articles within 24 hours of being ordered to do so. If there is an example of social control by stealth, this is one. The new framework was presented as an innocuous piece of regulation ostensibly to equalize the playing field between online and offline news. Of the 10 web-based media notified by the MDA as falling within their criteria for control, ironically nine of the ten are government-friendly, owned by Singapore Press Holdings, and Media Corp. The exception is Yahoo Sg. Although the “usual suspects”, namely sites such as Temasek Review Emeritus (TRE), The OnLine Citizen (TOC), Public House sg and many others which provide alternative news forum are not immediately named by the MDA as falling within the ambit of their control, they are anxious that these new regulations would eventually threaten their very survival, and financial viability. They are also concerned that it could curb “fellow Singaporeans’ ability to receive diverse news information”. This latest regulation attracted instant and universal rejection by netizens. But is this simply a stupid decision on the part of a single Minister or someone at the MDA? Or is it a case that the PAP has not learnt the errors of their way by misjudging the mood of the population? I believe the answer is “No” to both questions. There are just a thousand days between now and the 2016 general elections. With the way the public has responded to issues such as AIM, and the Population White Paper, there is no reason for the PAP to feel confident that they could do better in 2016 than in 2011; and the outcome of the by-elections at Punggol East was most worrying for them. It is a movement without leaders, organisation, or membership. Yet it has a capacity to grow, and is already setting the political demands for change. The power of this virtual movement lies in its ability to synergise the individual desires for democratic changes in Singapore into real collective political actions. The energy within this virtual movement comes from the decades of pent up frustrations, as well as the feeling of betrayal of the Singapore cause by the PAP elites who have, over the decades, evolved into a self-serving bureaucratic capitalist class. All of us are now part of this VMD. It is this VMD which is now setting the political agenda in Singapore. The avalanche of criticisms against AIM, the Population White Paper, and now the control of the Internet are not led by any of the opposition party, but by the uncoordinated collective efforts of individuals in cyberspace. They include those who write articles, bloggers, those who make comments, those who distribute articles through facebook and social media. The VMD would not be a potent political force without a buoyant cyberspace. At the same time, the cyberspace in Singapore would be sterile without the VMD. It is this symbiotic relationship between the VMD and cyberspace that triggered the need for control, hence the MDA’s new regulatory regime. In the times before 2011, the government could look at those in cyberspace as irritating but tolerable armchair critics. After all, up to the 2011 elections, cyberspace and netizens do not reflect electoral intentions. By the time of the Punggol East by-elections, cyberspace becomes the mirror of the people’s mood for change. Over the Population White Paper, the government not just lost their ability to set the news agenda, it could no longer control the contents. It was the various websites and the traffic in cyberspace that eventually brought the thousands to rally against the government’s 6.9m population policy at Hong Lim Park. It is instructive to note how Cheong Yip Seng, the former Chief Editor of The Straits Times describes the government obsession over the control of the media: “The government sees this in terms of what it calls “setting the agenda”. It wants to ensure that at all times, it… not anyone else… controls the agenda.” [pg 427 OB Markers] And now they have lost that power. To continue its position as a dominant party, it is crucial for the PAP to retain The Straits Times as the dominant paper. Yet the paper is increasingly referred to in cyberspace as “The S***ing Times”, while many are relying on alternative news websites to follow political events in Singapore. So long as The Straits Times continue to be the mouthpiece of the government, its relevance as a newspaper will decline. Equalizing the playing field in this context would simply mean that the government wants to put independent news media under such pressure of control that they would toe the line as The Straits Times does for commercial survival. The government is certainly aware that this new regulation will incur the wrath of netizens. That, to them, is a smaller price to pay than to allow the VMD to grow unchecked as that certainly could threaten the PAP electoral fortunes by 2016. Ultimately, the final solution is to vote out the PAP so that we can have the political space to restore our democratic constitutional rights. (see my Critique on Tharman’s Pap as a Dominant Party in TRE and Public House sg,). During the interim, we need more guerrilla-type bloggers and cyber-warriors to counter the current set of regulations. Each time we forward an article we like in cyberspace to our friends and acquaintances, we are actively undermining the legitimacy and dominance of the PAP. Meanwhile, may the VMD grow and grow. The Cherian George gate: La trahison des clercs at NTU? In the following message from the organizers of the petition concerning NTU's unfair evaluation of Cherian's George's quality of scholarship and teaching, and its unjustified denial of tenure to George, it is clear that George's professional colleagues at the School of Communication and Information value his research and teaching at the school, and endorsed his tenure. However, for some non-academic reasons (political pressure? ), either the College of Humanities, Arts and Social Sciences or NTU refused George his tenure, and thus terminating his services at NTU. What a disgraceful and despicable act of betrayal of academic integrity (la trahison des clercs) if indeed NTU had kowtowed to Singapore's political masters. We demand that NTU, which is a public institution and accountable to the Singapore public, be transparent and reveal the exact areas in teaching, research and publication where George is considered deficient, and the relevant supporting evidence. We will then judge whether Cardiff University professor Karin Wahl-Jorgensen, who has reviewed George's teaching and scholarship as part of the tenure process, is right to be outraged by NTU's denial of George's tenure. The petition, signatures and comments were delivered to four key professors yesterday. The organisers of the petition today (February 28, 2013) met with Dr Benjamin Hill Detenber, chair of the Wee Kim Wee School of Communication and Information (WKWSCI), as well as Dr Mark Cenite, assistant chair of the school. Dr Alan Chan Kam-Leung, the dean of the College of Humanities, Arts and Social Sciences (HASS), was unable to attend the meeting because he was travelling overseas. - Given claims by Dr Karin Wahl-Jorgensen on February 23, 2013 that the denial of a tenure contract could have been politically motivated, as well as members of the WKWSCI community and the public echoing similar sentiments, NTU is obliged to provide categorical assurances that there is no policy of curtailment of academic freedom or political discrimination in the university. We also conveyed to the two professors that the petition is wholly organised by students, and does not involve any faculty member, including Dr Cherian George. In addition, we made clear that what was said in the meeting was to be on the record. Dr Detenber told us that Dr Chan and the NTU provost and deputy president Dr Freddy Boey were best placed to comment on the issue of academic freedom in the university. He assured us that the two of them would meet us at a later date. Dr Detenber then provided us with a brief outline of how the tenure application process works in NTU, and in particular, in WKWSCI. He emphasised that the process does not involve self-nomination or seniority. Instead, it is kick-started by an internal promotions and tenure committee in WKWSCI, who select candidates based on merit. The nominations are then sent to the chair, who eventually decides on who to endorse, with the help of a separate advisory committee. The endorsed nominations are then sent to the dean of the college of HASS and his own advisory committee, and later to a university-level promotions and tenure review committee. The final approving body for tenure applications in NTU is the Academic Affairs Council, which is a subset of the university’s board of trustees. Dr Detenber said at the school level, WKWSCI had endorsed Dr George as a nominee for a tenure contract on both occasions, adding that he was making this clarification with the approval of Dr Boey. He said he was unable to comment on whether the nominations on both occasions had been cleared at the subsequent levels. Dr Detenber also said that the school had nominated Dr George to be reappointed as the head of the division of journalism and publishing in 2010, but the university turned this down. A tenure contract in NTU refers to a full-time permanent faculty position with no periodic contract reappointments until retirement. Dr Detenber said tenure-track professors employed in NTU first get a three-year contract before they are put up for consideration for a tenure contract. If they fail to get a tenure contract at the first attempt, they would then be granted another three-year contract. If they fail at the second attempt, they would be then allowed to stay in the university for another year, before being asked to leave. This policy essentially means that Dr Cherian George will leave NTU within the next year. Dr Detenber also affirmed Dr George’s teaching credentials. He said WKWSCI fully recognised Dr George’s quality, and that this was validated by the fact that it nominated him for a teaching award in 2009, which he won (ed. NTU news here). Dr Cenite also pointed out Dr George’s distinction in pioneering the annual Going Overseas for Advanced Reporting (GO-FAR) programme as well as in helming the Asian Journalism Fellowship. We will further apprise signatories on new developments and plans after our meetings with Dr Chan and Dr Boey. Dr Detenber also said he was considering the best way to engage the WKWSCI community on this issue. This message is from Bhavan Jaipragas who started the petition "Tenure contract for Dr Cherian George"
A GROUP of professors from the Nanyang Technological University (NTU) has raised a protest to varsity heads over the process of awarding tenure. Unhappy about what they call a 'non-transparent' process, the group of about 10 has sent e-mail messages to the heads of their respective schools as well as to NTU provost Bertil Andersson, who has said the claims are baseless. The group has also sought help from the Education Services Union (ESU), a body affiliated to the National Trades Union Congress (NTUC) which was set up to promote good relations between employees of private education institutions and their employers. However, the group was turned away because ESU can represent only bargainable employees, and university faculty members are considered non-bargainable staff. Instead, the ESU has referred the case to the Ministry of Manpower. At the centre of the professors' complaint is something called the T65 contract, which guarantees them a place on the teaching staff till they hit the age of 65. It is the most coveted contract among professors. More than a dozen professors have claimed that the selection process for the contract is 'biased and undemocratic'. Last year, 640 of NTU's 1,500 faculty members applied for the T65 contract. Of these, 55 per cent, or 352 professors, were awarded the contract. Some of those who missed out are now claiming that they deserved it too as they had more publications to their names or were rated higher on student feedback forms than some professors who received the coveted tenure. However, the university's administration has defended the integrity of its review process. Professor Andersson said that since 2007, the process has involved internal committees and external referees assessing T65 applicants on the merit of their research, teaching and service to the university. He added that members of the Academic Research Council, set up by the Ministry of Education to oversee national research and development efforts, had commented that NTU's 55 per cent tenure success rate squared with international standards. Prof Andersson also said the unhappy professors were in the minority. Only 5 per cent of the 288 unsuccessful T65 applicants had sent in appeals. However, 15 or so professors who spoke or wrote to The Straits Times insist they have a case. Associate Professor Michael Heng, from NTU's School of Electrical and Electronic Engineering, is among them. He wrote to the newspaper last month, alleging 'serious lapses' in the process. He said that in internal school meetings, faculty members were told by their Chairs that only research counted in the tenure review. They were told teaching and service to the university were not important, he said. The other professors, speaking on condition of anonymity, said they agreed with him. They said they had tried in the past to get their views aired, but without success. After being turned away by the ESU, they attempted to set up their own union, and went as far as drawing up a draft Constitution. But NTUC advised them against doing this because unions should represent all employees in a organisation, not just its executive-level ones. Tenure review processes at the National University of Singapore and Singapore Management University are similar to those at NTU. NUS and SMU spokesmen said multiple layers of checks were in place to ensure transparency, and that tenure review is an accepted practice at the universities. Cherian George denied tenure at NTU: political masters at work? SINGAPORE - A Singapore journalism professor who has written extensively about the lack of media freedom in the city-state has been denied tenure a second time, and hundreds of his supporters at home and abroad are demanding to know why. 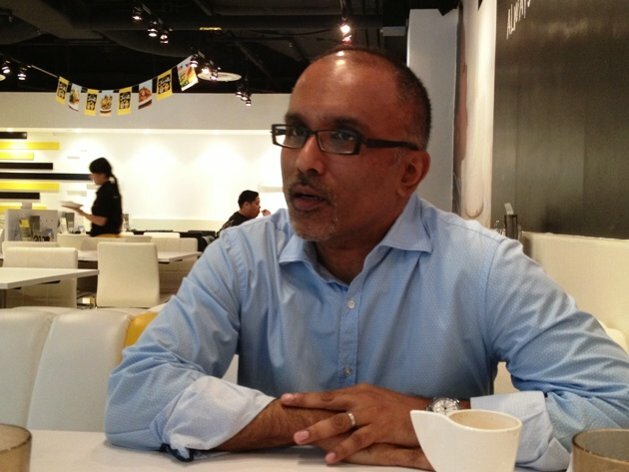 Supporters of Cherian George, an associate professor in journalism studies at the Nanyang Technological University's School of Communication and Information, contend that his credentials are so strong that politics must be behind the university's unwillingness to give him a permanent faculty position. His first application for tenure was rejected in 2009. Karin Wahl-Jorgensen, a professor from Wales' Cardiff School of Journalism, Media and Cultural Studies, said she was one of the outside experts who reviewed George's case for tenure. She called him one of the "foremost public intellectuals in Singapore," and called the rejection "incomprehensible and plainly absurd." "I can only speculate about the reasons for this decision not to grant tenure to someone known for being critical of the government but it does not make NTU or Singapore look good in the eyes of the international academic community, and raises serious questions about academic freedom," Wahl-Jorgensen said in an email to The Associated Press. The Southeast Asian country, known for its groomed image of efficient governance and political stability, has long been criticized by human-rights groups for using measures such as criminal and civil defamation to stifle opposition voices critical of the government and its leaders. The People's Action Party has ruled since 1959 but has seen support drop in recent years as discontent grows over the high cost of living, an influx of foreigners and rising income inequality. A former journalist, George holds degrees from Cambridge and Columbia University and obtained his doctorate from Stanford University. He is known for his books such as "Freedom From The Press," which assessed the state of media and politics in Singapore. Nanyang Technological University did not respond directly to queries from the Associated Press. In a media statement Tuesday evening, the public university said it has a "rigorous tenure process" in place but added that "as all employment matters are confidential, NTU will not comment on any specific cases." George said he learned of the rejection last week, but he declined to comment further. A former student of his, Bhavan Jaipragas, began a petition demanding that the university disclose reasons behind its decision to deny George tenure, along with details on how it assesses the teaching quality of faculty members seeking tenure. The petition had received about 800 signatories by Wednesday. Bhavan said copies were to be delivered later that day to NTU's president and other key university leaders. "There are complaints of curtailment of academic freedom and we want the university to categorically assure the student body there is no policy of curtailment and political discrimination," said Bhavan. "We don't want them to just say it but to prove it to us." The issue has reignited debate over freedom of thought in Singapore's universities, a debate that also has brought attention to a joint venture between Yale University and the National University of Singapore to open a liberal arts college in the city-state. Enrollment begins in July this year. Some Yale academics have criticized the move, accusing the university of compromising its values for being involved in a country where freedom of assembly is restricted and homosexual activity banned. The president of Yale-NUS, Pericles Lewis, has said the college has received guarantees that academic freedom will be protected. An outspoken associate professor for journalism in Nanyang Technological University (NTU) has been denied tenure, sparking an outcry and raising questions over academic freedom in Singapore. Cardiff University professor Karin Wahl-Jorgensen tweeted Saturday morning that Cherian George, associate professor at NTU’s Wee Kim Wee School of Communication and Information (WKWSCI), was denied tenure “on the grounds of quality of teaching and research”. In subsequent tweets, Wahl-Jorgensen, who revealed that she was one of the reviewers for George’s case, said she was “outraged” at the decision not to grant him tenure, and that it could have been “because he sometimes expressed political opinions”. An adjunct senior research fellow at the Institute of Policy Studies and former journalist with The Straits Times, George has spoken out against media control and has been critical of the ruling People’s Action Party. He joined NTU in 2004. Wahl-Jorgensen alluded to NTU’s decision being detrimental “for academic freedom” and said it raised “big question marks about international collaborations” with Singapore and NTU. She said also said George’s application was “watertight” and believed the board’s decision “made no sense on grounds of research and teaching”. Tenure would give him the contractual right not to have his position terminated without just cause. George was previously denied tenure once in 2009 when he was promoted to the position of associate professor. Typically, academic promotions are accompanied by tenures. In reaction to the news, an online petition was set up by final-year WKWSCI student Bhavan Jaipragas to urge the NTU board to “affirm (George’s) stellar teaching credentials and disclose the reasons behind the decision to deny his tenure”. A day after the petition was initiated, the number of signatories have more than doubled to 686 signatories as of press time. “We felt it was very important any impression that Dr George's teaching skills were sub-par had to be quickly demolished. We also want the school and university to… categorically dispel claims of curtailment of academic freedom in NTU,” said Bhavan to Yahoo! Singapore. Bhavan said he heard of the news from several sources over the weekend, before such tipoffs were confirmed by Wahl-Jorgensen’s tweets. He said he will deliver hard copies of the petition with the list of signatories to four key members of the NTU leadership, including NTU president Bertil Andersson. Among several high-profile signatories who have come forward include Lai Ah Eng, senior research fellow at the Asian Research Institute at the National University of Singapore. She said, "Our local intellectual resources are already so limited and seem to be declining with academic globalisation. We need people who have both global and local knowledge, and Cherian has it. If we do not hire the likes of him, then who do we hire?" Among the students who have spoken out against the alleged grounds, alumnus Johnson Zhang commended George for being friendly and knowledgeable. “To say that the quality of Dr George's teaching was 'sub-par' would be an insult to us graduates who had the honour of learning from him,” said Zhang. “As someone who has worked with Dr George for close to two decades, I am dumbfounded by the news. I don't know of many professors in NTU who give as much to the students, even fewer who have clear vision of how a great journalism department in an university can be and should be,” said WKWSCI photojournalism lecturer Tay Kay Chin in a post on Facebook. George declined comment when approached by Yahoo! Singapore. In a statement issued Tuesday night, an NTU spokesperson wrote:"NTU has a rigorous tenure process. All NTU faculty seeking tenure go through the same process. More than 1,000 faculty have gone through this process at NTU in the last six years and so far, more than 55% have been granted tenure." "The tenure review process is purely a peer-driven academic exercise comprising internal and external reviewers. The two equally important criteria are distinction in research and scholarship, and high quality teaching. Service and other contributions to the university, profession, or community are also taken into consideration." "As all employment matters are confidential, NTU will not comment on any specific cases." Last year, the issue of academic freedom was raised in relation to the launch of the Yale-NUS College, a partnership with Yale University and the National University of Singapore (NUS). Yale members passed a resolution expressing their concern restriction of civil liberties in Singapore. I felt compelled to do this after the whole Cherian George debacle erupted. It might make me seem a little opportunistic, but I hope the larger point I'm making wins out. 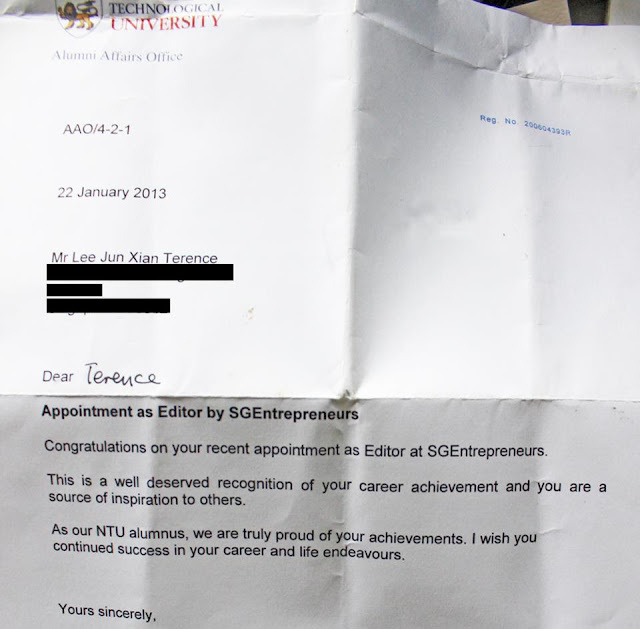 Anyway, here's the background: In January, NTU sent me a congratulatory letter (see photo) about my recent appointment as editor of SGE. It's a nice gesture no doubt, but after what has played out recently, I feel like I can no longer accept the content of the letter. After all, I owe a lot of what I am today to the journalism faculty at WKWSCI, of which Cherian George played a major role in shaping. first of all, I would like to thank you for sending out the congratulatory letter to me about my recent promotion. It came as a pleasant surprise, and I deeply appreciate the gesture. However, after the recent debacle in which an esteemed journalism prof was denied tenure for dubious reasons, I feel compelled to reject the letter. Please don't take this personally, as faculty affairs certainly isn't under your purview. So if for any reason you are inconvenienced, please accept my sincerest apologies. But do hear me out. I don't think I can accept praise from the university when the person that inspired me and many others isn't given due credit and recognition. I echo others in saying that Cherian George is one of the most engaging instructors in NTU, and his example has certainly inspired me to pursue my current career path. So, I am sending the letter back to the university as a form of protest. Please show my note to your colleagues, and you may send it back to me when he is finally given due credit. The writer, a Singaporean, is professor of strategy at the Stephen M. Ross School of Business at the University of Michigan. The ongoing debate about Singapore’s population policy provides a timely opportunity to reconsider how different pieces of our economic growth model fit—or do not fit—together. GDP (output) growth in any country comes from either or both increases in inputs (primarily land, labour and capital) or the productivity of those inputs. As noted first in Lee Tsao Yuan’s 1982 Harvard PhD economics dissertation, and continuing to the present day, Singapore’s GDP growth has depended more on input than on productivity increases, as reflected in the high dependence on foreign labour. This has had the unintended (but predictable) consequence of discouraging increased labour productivity. Employers could increase output more readily and cheaply by recruiting foreign workers, particularly from lower-income countries, than by investing in capital-labour substitution and upgrading the skills of the domestic labour force. This was and is an entirely rational decision for profit-maximising private enterprises. But increasing output by increasing inputs eventually runs into the problem of diminishing marginal returns. In Singapore’s case, this is because the addition of more and more people to an essentially fixed and extremely scarce complementary resource, land, inevitably raises other costs. These include rising residential housing and commercial rental costs, and congestion costs especially in transportation. Also, both higher housing costs and lengthening commute times effectively lower the real wage of workers (e.g. because it now takes them 10 or 11 hours to earn an 8-hour daily wage). In a closed labour market, the rising cost of living eventually translates into higher nominal wages. But in an open labour market like Singapore’s, wage increases held down by the increased supply of foreign labour discourages the substitution of capital, higher technology and sophisticated management processes, for labour. This is why the policy of tightening foreign labour supply and increasing labour productivity is necessary. One way by which the chronic excess demand for labour that Singapore has long suffered (despite or because of a liberal immigration policy) will be reduced is by some businesses moving out of the country. This is a normal process of adjustment to shifting comparative and competitive advantage. What is important here to smooth such adjustments and minimise the costs to both employers and workers is commitment to a clear long-term labour market policy that will not vary according to short-term business or electoral cycles. But the application of such a policy should not be blunt—applied with immediate and equal force across all sectors—but nuanced and gradual, according to the circumstances of individual sectors and businesses. Economic planning agencies need to be involved in calibrating the demand side of the labour market. For example, they shouldn't provide incentives to businesses whose highly specific manpower needs require a heavy reliance on imported labour and talent, with few jobs for native Singaporeans, or which are highly land-intensive. Choices and trade-offs must be made—not between growth and foreign labour dependence, but between different sectors that will contribute to growth. Given Singapore’s extreme land scarcity, continuation of heavy (if reduced) reliance on foreign labour and immigration has another unintended consequence. It contributes marginally to the low fertility rate and emigration of native Singaporeans, and to labour force participation rates that are lower than they might be for certain demographics. These are, for example, mothers of young children, and professionals and skilled workers over 50 years of age who in other developed countries would be at the pinnacle of their careers, but in Singapore are too often sidelined in favour of cheaper (or more globally accomplished) imported talent. High housing costs reduce fertility by delaying the age of marriage (since young couples need to both work for a long time to save enough to afford their own home, especially in the unsubsidised private market where they must compete with large numbers of foreign buyers). Also, long commutes on congested public transportation reduce time for social interaction and family formation, and make it difficult to transport children for childcare and schooling. The costs of child-raising are high, including for some the need for (mostly foreign) maids and nannies to enable both parents to work. This again increases population density, including in the ever-shrinking space of home. Competition with foreigners in school and the job market also increases the stress and expense of child-raising. Emigration to more land-abundant countries also becomes more attractive to young Singaporeans who do not see themselves ever being able to replicate or even approach their parents’ standard of living if they stay home, faced with the ever-increasing costs of living, declining quality of life, increased job market competition and a perception of discrimination vis-à-vis foreign talent and immigrants. The feeling of being treated as a “second-class citizen in my own home”, and being crowded out by foreigners, adds to the loss of physical markers of “home”—buildings, land, green and wild areas which in every country constitute part of the native’s national patrimony and identity—in discouraging the sojourner’s return to be a “stranger in a strange land”. The over-representation of foreigners or immigrants in the leadership and even middle ranks of many organisations also suggests that a “glass ceiling” exists for the locally-born, such that upward career mobility may be more limited than in a larger foreign country. From a purely GDP growth input perspective, it may not matter if emigrating or low-reproducing native Singaporeans are readily replaced in the labour market by immigrants and new citizens. But particularly at the high end of the skill ladder, among the globally-mobile talent that the country wishes to attract, many of the same “push factors” operate to discourage a permanent stay in Singapore—from the cost of living to quality of life—reinforced by lack of the bond of a shared collective national identity. For those who do stay, sheer numbers (and what some say is the difficulty of making friends with Singaporeans) encourage “clustering among their own” rather than integrating into native Singapore society, and their birth rates will also fall over time for the same reasons this has happened with native Singaporeans. Territorial land is the essence and foundation of a nation. In Singapore, the wisdom of using retirement savings to fund home ownership, including in subsidised public sector housing, has been premised on the assumption of constant asset appreciation. Large-scale immigration contributes to asset appreciation, and thus to the profits of REITS and both private and government-linked property developers. But asset appreciations based on increased land scarcity are essentially rents that transfer income from buyers to sellers, thus contributing also to rising inequality. From a long-term growth perspective, they distort incentives to work, save and invest in value-creating activities in favor of rentier wealth or income from property “investments” (or speculation). Asset inflation also hurts growth by raising the cost of doing business and discouraging entrepreneurship especially by SMEs and local businesses which cannot afford to compete with global multinationals for commercial and retail space. We should not forget that a major factor in the downfall of the medieval Italian city-state of Venice was the diversion of entrepreneurial capital and energy into property as the small land-area drove rising rentals and land prices, leaving the city with beautiful buildings that today are but a shell for visiting spectators to admire. Beyond these economic considerations, an increase to the already absolutely and proportionately large numbers of temporary foreign workers and new immigrants has resulted in social pressures and political tensions that threaten to make Singapore less livable and less attractive to foreigners turned off by the perceived hostility of natives, as well as natives who feel their livelihood, lifestyle, electoral impact and nationhood undermined by the overwhelming presence of foreigners. Land and people together constitute a nation. All of us, new and old Singaporeans alike, and temporary residents, will be better off if our population policy takes a more comprehensive view of both economic growth and social integration in this small but precious piece of land. Fortunately, there are alternative solutions that, together as a nation, we can make work. Singapore’s population in 2030 will not be as large and its older people as unproductive as what the government expects, an Austrian demography professor said Tuesday, Feb 19, 2013. In a public lecture organised by the Institute of Policy Studies to some 140 attendees at RELC International Hotel, Professor Wolfgang Lutz, founding director of the Wittgenstein Centre for Demography and Global Human Capital, estimated that Singapore’s population that year would be 6.1 million, bearing into account increases in the city-state’s population every 5 years since 1970. In a recent white paper, the government projected that there would be between 6.5 million to 6.9 million people in Singapore by 2030, sparking a backlash among Singaporeans, many of whom have complained that the large influx of immigrants in recent years have strained infrastructure and pushed up the cost of living. Government leaders have also maintained that a steady, albeit lower, pace of immigration would be needed to sustain economic growth to compensate for Singapore’s low total fertility rate and ageing population. In his hour-long presentation, Lutz declared that the negative effects of an ageing population have been blown out of proportion and argued that Singapore’s vast tertiary-educated population core will counter the consequences of low replacement levels. With longer life expectancies, Lutz said, "I think there is no reason to have a government-set universal retirement age". Currently, the statutory minimum retirement age in Singapore is still 62, but employers are required to offer re-employment to eligible employees who turn 62, up to the age of 65. Lutz reasoned how the lack of a pension scheme and the government’s encouragement towards self-sufficiency made such a retirement age redundant. “People have different preferences, financial situations and health status. If somebody thinks he or she can afford to retire at the age of 50 and vice versa, why not? The government pension schemes need to be structured flexibly based on an insurance principle, however,” said Lutz. Lutz said Singapore, like Germany, could be among the countries with the oldest population in the world but still be able to thrive with a knowledge-based economy. He said that a high proportion of 50- to 60-year olds would yield good results for Singapore’s economy as they would have come mostly from high levels of education and, thus, be able to contribute in terms of experience and foresight. Meanwhile, attendees voiced concerns of over-education in which too many citizens have to fight for too few jobs. In response, Lutz said that lifelong learning and broad education were ways citizens could combat such problems. He urged governments to put in place more measures in schools to welcome back citizens for continued education at more periods in their lives. “There is never a point when we feel that we have learnt enough. A broader tertiary education gives the basis for people to learn more skills. As our lives get longer, why do we have to push all education in the first part of life?” said Lutz. One of Lutz’s suggestions to recalibrate expectations of an ageing population is to redefine what exactly an age that is considered to be old, is. Doing so would change the measure of the number of working people needed to support the old, Lutz said. In the white paper, the government expected a drop in the number of working citizens supporting the aged, from a current ratio of 5.9 working-age citizens for each citizen aged 65 and above, to a ratio of 2.1 by 2030. “70 is the new 60. Educated, old members still can be a productive part of society. Looking at Singapore’s population in an international context, Singapore has one of the strongest transformative societies in recent human history,” said Lutz, referring to the drastic jump in higher-educated residents. Lutz caused much conversation when he said last Wednesday that Singapore’s optimal TFR should be 1.7, lower than the replacement level of 2.1. He is in Singapore for three weeks as a distinguished professor of the National University of Singapore Society. Lutz is founder and director of the Wittigenstein Centre for Demography and Global Human Capital. Things got even weirder when a Superintendent Goh Tat Boon showed up. He said he was from Bedok Division, not the Internal Affairs Office and that he was going to exercise his ‘power of seizure’. The Internal Affairs Office is located on the 17th floor of Police Headquarters at Irrawady Road. My first visited there lasted about two-and-a-half hours. The interview took place inside a small office. The door was left open at all times, the air conditioning was just nice, Superintendent Lim was civil and polite throughout. He asked if the interviews were recorded in ‘segments’ and if so, why. I explained that this is how the camera we used works – it automatically records in segments. Looking back now, I think what the Superintendent was really interested in was whether a lot of time elapsed between the ‘segments’. What happened when the two men were off camera? Did I say anything ‘extra’ to my interviewees? If he’d asked me, I would have told him that very little time elapsed between the ‘segments’. We were racing to finish four interviews in one day. Each one lasted at least one-and-a-half hours. I couldn’t afford to waste precious minutes. 9am on Wednesday. James told me that the police were back again. This time, it was two officers from the Internal Affairs Office and Superintendent Goh Tat Boon from Bedok Division. He seemed to be in charge. I let them in and Superintendent Goh got straight to the point. He wanted to seize my laptop, iMac and mobile phone. I asked why these were needed as the police already had the drive containing all the footage of my interviews with He and Liu. All Superintendent Goh would say was that the three devices were ‘necessary and related’ and that while it was ‘unpleasant’ for me, he had to take them. My suspicions were reinforced when they started examining my computer. Two officers from the Technology Crime Forensic Branch explained that they would start by removing my hard disk before connecting it to something called a ‘write blocker’, to ‘ensure that no data is overwritten or introduced’. I asked what they would look at when they were examining my hard disk and an officer called Florence Koh said that this would be ‘anything related to the case’. There were no videos in my phone and the photos proved pretty uninteresting to Investigating Officer Florence Koh. So in the end, most of her time was spent examining my SMSes – messages from my mother telling me about my Dad’s hospital schedule, silly texts from James, plans for meet ups with a close girlfriend. It was surreal going through every single one of these with a stranger. Koh was particularly interested in any contact I might have had with the men’s lawyers and their case worker. She also flagged a text I had sent James the day before: ‘We’re being followed at I12’. I left Police Headquarters at around 10pm. A group of people had gathered outside the gate. Many of them are my friends, but there were a few I had never met. I am incredibly moved that they cared enough to make the effort to go to Irrawady Road just to make sure I was okay. Was there some kind of conspiracy between the drivers, their lawyers, political parties NGO workers and myself to fabricate the allegations? The suggestion is ludicrous. The men were not coached. There was no script, not even a list of pre-prepared questions. He and Liu were interviewed separately. Each session consisted of just three people – the relevant driver, the cameraman and me. No one else. There were no retakes. Over the past 15 years, I have worked for some of the world’s biggest news broadcasters and completed multiple stints at two different United Nations missions. James and I have made documentaries in refugee camps and live minefields, in post-conflict zones and inside the world’s most secretive state [ed. video below]. We’ve filmed rebel leaders and Maoists soldiers, interviewed political figures, Nobel Prize winners, a murderer, militiamen and ordinary people. We make a good living doing what we love. We’ve even won a few awards here and there. Why on earth would I throw it all away by manufacturing two little soundbites? Members of the Internal Affairs Office assure me they are taking Liu and He’s allegations ‘very seriously’ and that they would get to the bottom of the matter. I hope so and look forward to learning their findings. If the two ex-drivers lied, they should be punished. If they told the truth, then the police officers who beat them deserve to be brought to justice. Either way, I continue to follow the IAO’s investigations with interest. Maybe when they’re ready, they might even grant me an interview about their work – an on-camera one lasting way less than 7 hours. North Korean leader Kim Jong-il's love of film is well-documented, but few outsiders know that he is revered as a genius of cinema by his own people. Now, this groundbreaking film opens a window inside the world's most secretive country and an elite academy, where young actors are hand-picked to serve a massive propaganda machine. Filmmakers Lynn Lee and James Leong spent more than two years on this project, becoming the first foreigners to film inside Pyongyang's University of Cinematic and Dramatic Arts. On this edition of 101 East (Al Jazeera), we gain a rare insight into the beating heart of North Korea's extraordinary film industry. Surely the police have better things to do? According to news reports, a freelance filmmaker spent close to eight hours at the Singapore police headquarters in connection with her recent interviews with two ex-SMRT bus drivers from China (here). Her iMac, mobile phone and laptop were also similarly seized. Added to that very understandable inquisitiveness is the right of all Singaporeans to hear both sides of the story. Lee’s desire to speak with the bus drivers to get their version of events is therefore in line with her profession and public interest. All the efforts and time spent on seemingly investigating her appears to me to be a waste of police time and public resources. If the police are trying to investigate the allegations of assault, shouldn’t they be speaking to the persons involved directly? I.e. the police officers implicated and the bus drivers themselves! Why question a third party journalist who was not at the “scene of the crime”? Perhaps the police merely wanted to ascertain that the bus drivers did make these allegations in her presence and wanted to take her statement. But surely, that would not take 8 hours? Besides, why confiscate her mobile phone? This is not the first time the police have apparently been overzealous. In 2005, they quizzed filmmaker Martyn See on his film about opposition politician, Dr. Chee Soon Juan. They even ordered for his tapes and video camera to be surrendered! Again, what was the point of going after a filmmaker who was just trying to make a documentary on an individual who Singaporeans are intrigued by? Surely, Singaporeans are entitled to hear Dr. Chee’s side of the story? As a Singaporean, I wonder if the police force (funded by taxpayers) should be spending our resources on these rather pointless exercises? Surely, the police have better things to do?